Hello everyone! 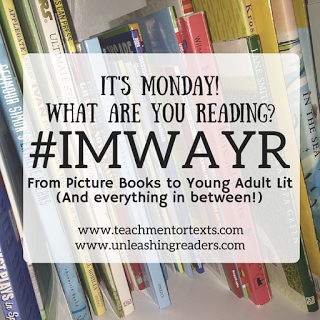 It's Tuesday- I know, but I had a little free time on my hands, and decided to participate in the Young Adult/Teen version of "It's Monday, What are You Reading?" hosted by Unleashing Readers. Hopefully, from next week onwards, I can post on Monday. I haven't had much time to read this week. I've finished one book, and am currently reading a second. I finished reading Family Life by Akhil Sharma. I didn't enjoy it very much. Although the synopsis caught my attention, the writing style bored me, and I felt as though the story line moved too slowly. Maybe it just wasn't a book for me. I am currently reading Landline by Rainbow Rowell, the author of Carry On. I am enjoying this story so far. It's about a TV Script writer juggling her family and her chance at a big break. Look out for a review sometime next week! I've put aside The Zahir by Paulo Coelho because I found it slow. The book was taking me time to read, and I wanted to give it my full attention. I'll continue reading it once summer vacations begin. I'm also looking forward to reading Sparkling Cyanide by Agatha Christie. I hope to get my hands on the library copy of The Boy in the Striped Pyjamas as well. Hope you have a spectacular reading week! Check out Unleashing Readers ,and Teacher Mentor Texts the blogs that host this meme.